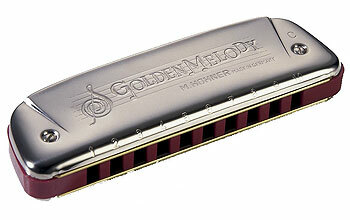 Don’t get me wrong, the Hohner Golden Melody is a phenomenal professional instrument, and though it’s a very good instrument for beginners, I have not found it to be the best. Smooth, rounded corners fit nicely into the palm of your hand as you play this harmonica, the favorite of great harpists such as Pierre Lacocque (Mississippi Heat) and Carlos Del Junco. This unique design coupled with an air tight, dark red, plastic body sets this 10-hole instrument apart. The Golden Melody has equal temperament tuning for melody playing, which makes it a natural for Country Music, but it can still bring down the house on blues and rock numbers. All major keys available. Hohner’s diatonic harmonicas set the industry standard through their high quality construction, excellent response and unsurpassed tone. Often called “Blues Harps”, they have been a fixture as melody and accompaniment instruments in blues, rock, country, and folk bands, as well as many other styles of music and musical ensembles. Richter tuning and undivided air channels allow for bending and overblowing the reeds, creating the signature wailing sound typical of the harmonica. This is the essence of the Classic line — traditional values and cutting edge technology. Extremely precise tools minimize air loss and ensure a quicker response and bigger volume. As always, each Classic harmonica is exclusively handmade. Attractive 1950s look, with full length covers, closed at the sides. The Golden Melody is the only Hohner diatonic harp featuring equal tempered tuning which makes it especially suitable for melody playing. I love my hohner golden melody in c,plus it,s gold anodised covers , the special 20 must be very good to be endorsed by jp allen himself. I’m no JP… and I’m still relatively just a beginner… but for the random OTHER beginner out there who is shopping around.. lemme tell you: TRUST ME, there is a BIG DIFFERENCE between the Special 20 and the Blues Band or the classic Hohner “cheapo” unlabeled harp I also have. For the total noob, what I’ve found about the Special 20 is it requires VERY low air flow to make the same volume as the Blues Band. It also has a fuller sound. And I mean CLEARLY fuller sound, even to a beginner. It was immediately clear. It is DEFINITELY worth it to buy a more-expensive harp than not! I’m currently tempted and shopping for a Marine Band, maybe a Crossover.